Mississippi transfer Shea Patterson will be under center when the 14th-ranked Wolverines open the season on the night of Sept. 1 at No. 12 Notre Dame. ANN ARBOR, Mich. (AP) — Jim Harbaugh was hailed as a savior when he came back to Michigan, a former star quarterback tasked with returning college football’s winningest program to glory. Harbaugh hasn’t been able to do it yet and, perhaps coincidentally, quarterback has not been a position of strength for the Wolverines his first three years. By all accounts, Harbaugh has found what he has been looking for — a dynamic playmaker at quarterback. Patterson will play behind an offensive line that has improved, according to coaches and players, and he will be able to rely on a pair of experienced and talented running backs, a handful of potentially potent receivers along with perhaps one of the nation’s best defenses. 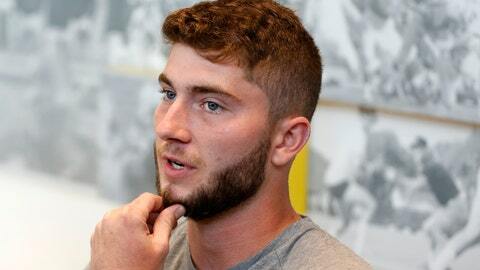 “I think Shea Patterson will be the whip cream on the cake that Harbaugh has been missing,” said former Dallas Cowboys executive Gil Brandt, an NFL draft consultant and SiriusXM Satellite Radio analyst. If it seems that everything is lined up for a banner year at Michigan, it’s been a journey and then some for Harbaugh (28-11 in three seasons and a pair of bowl losses) — and for Patterson. “When do you want us to come up?” Sean Patterson asked his son. “Tomorrow,” his father recalled him saying. Michigan’s new quarterback was born in Toledo, Ohio, and raised to root for the Wolverines, with Ann Arbor just an hour’s drive from home. He recalls watching Chad Henne play quarterback at the Big House with his father, whose family had season tickets. Sean Patterson, a salesman, moved his family south after the mortgage crisis hit more than a decade ago. That means Patterson’s path to Ann Arbor included stops in Hidalgo, Texas; Shreveport, Louisiana; Bradenton, Florida and Ole Miss. That doesn’t count a short stay this summer working out with the Triple-A Round Rock Express and picking the brains of professional baseball players. The Texas Rangers drafted him this year in the 39th round with the 1,169th pick overall, though he hasn’t played baseball since he was a junior in high school. Sean Patterson’s promotion at work pushed his family about 600 miles away to Louisiana. The rising quarterback prospect was enrolled at Calvary Baptist, where he was coached by John Bachman and led the school to consecutive state championships. By Patterson’s junior season, he had become a highly touted player who was welcomed to finish high school at IMG Academy where even more people were able to see the mobile quarterback with a strong and accurate arm. Patterson called Woodson to ask if that was OK, calling him with a number his father had because he was one of Woodson’s basketball coaches in Fremont, Ohio. “I think Charles made some stipulations that only he and Shea know about,” Sean Patterson said. Michigan’s passes last season were often high, low or wide. The Wolverines were a woeful No. 110 in yards passing nationally and 105th in total offense out of 129 programs at the highest level of college football last year. Returning starter Wilton Speight, who has since transferred to UCLA, struggled early last season before being injured and John O’Korn and Brandon Peters followed with lackluster results that led to an 8-5 record.